market or even pick up and unopened box on eBay for around $10. This image of The Ultimate Warrior is the best image of him there is, in my humble opinion. I even put it ahead of Warrior fellating Hulk Hogan at Wrestle Mania VI. 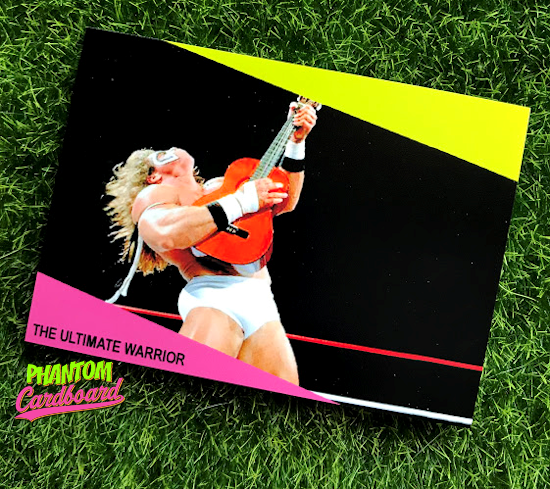 It just doesn't get any better than a face-painted, tassled, heavy metal haired Warrior shredding on The Honky Tonk Man's guitar. I'd like to imagine he's strumming his "Unstable" ring entrance music. I was a big fan of The Ultimate Warrior as a kid and always felt conflicted when it came to choosing between he and "The Immortal" Hulk Hogan. Anymore I realize that his actual in-ring work was lacking -to be nice, and his promos were really bizarre, even if oddly entertaining. But, as a kid all that mattered was that the guy was a jacked florescent maniac and what's not to love about that?? Recreating the ProSet design itself is nothing to puff my chest out over, but laying it over this image is something I'm glad I thought of. 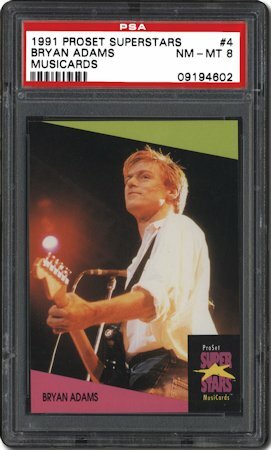 Even with the omission of the MusiCards logo the two elongated 90° lime green and pink mirroring triangles are instantly recognizable for anyone who's ever ripped open one of those plastic ProSet pack.